It was Newton, at the age of 23, who discovered in 1666 that the light of the sun was made up of a mixture of colors. By passing the light through a prism he broke the white light into several fundamental colors: these are the 7 colors of the rainbow, which can be further reduced to the basic colors: blue, green and red . Conversely, if you draw on a top a variety of radial stripes with the colors of the rainbow, by rotating it rapidly all the colors will blend and reform an almost white color. As Newton said, this discovery was really strange and created a real revolution at the time. If you have the opportunity to observe the sky during the day and preferably just after the rain, you can sometimes see a rainbow. Sometimes when the sky is covering you can also see a halo or iridescence near the Sun. Let’s see these different phenomena in detail. The rainbow always appears after the rain or under the spray of a cascade of water, when the Sun is halfway between the zenith and the horizon and when you have the Sun in the back. The drops of water suspended in the air refract and break down the light of the Sun as a prism and draw these beautiful colored bows that you have probably already observed. The colors blue and violet are always inside the rainbow, the red outside. Sometimes there is a secondary reflection on drops of water that gives rise to a second rainbow outside the first but whose colors are inverted. More rarely you can see a third rainbow but it becomes very pale and is often partial. Sometimes the rainbow is not multicolored. If the drops of water are relatively large (2 mm) it will take a very intense red color with a little purple and green. 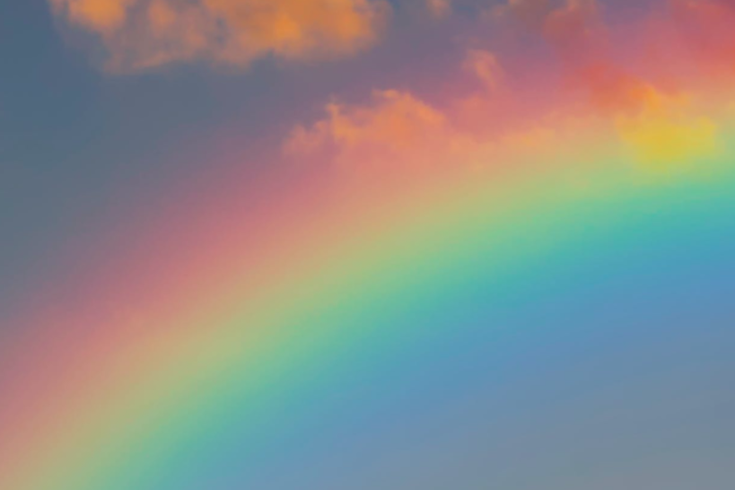 On the other hand if the drops of water measure less than 0.3 mm the rainbow will be very pale but at least twice as wide as an ordinary rainbow and all the colors will be visible. Between the two extremes, if you observe a rainbow in which the red is absent you can deduce that the drops of rain measure about 0.5 mm in diameter. Previous post Fly to The Moon!